(Nanowerk Spotlight) Just like other industry sectors, the furniture industry is trying to get more efficient by minimizing material use, minimizing waste, and optimizing energy consumption while improving the performance of their products. Nanotechnology and nanomaterials can play an important role in achieving these goals. In the near future, using nanomaterials in furniture may lead to a reduced need for adhesives and functional textiles. Expect to see "smart" furniture – furniture that heats itself when it's cold; becomes opaque when the sun is shining intensely; changes color upon demand; measures core body functions; has antibacterial coatings that get activated on contact or self-healing coatings to repair scratches and minor damage; has embedded electronics that for instance signals you when you run out of food supplies; or includes shape memory alloys that change their shape. Things like "smart carpets" that could help prevent falls or "Star Trek Classroom" with the next generation of school desks are already on their way. 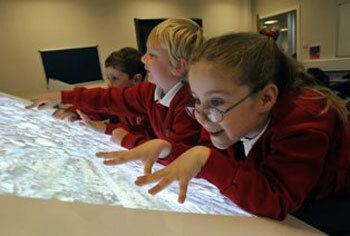 Using multi-touch desks in a futuristic classroom. A recent joint project by the European Federation of Building and Woodworkers (EFBWW), the European Furniture Manufacturers Federation (UEA) and the European Furniture Industries Federation (EFIC) mapped current uses and near future perspective on nanomaterials in the European furniture sector. It looked at innovative materials and potentials of nanotechnology that may positively affect the furniture sector; it also considered possible health risks and steps towards workplace prevention strategies following the precautionary principle. The findings have been published in a report that is available as a free PDF download. The project results are also documented in three fact sheets on the current use of nanomaterials in the furniture sector, the availability and use of information on nano-containing products and the safe work with nanomaterials and possible prevention strategies. Over the last years, nanotechnology has been applied to develop and produce different types of glass, i.e. non-reflectivity glass, privacy-glass, thermal isolation glass (based on InfraRed light reflection or absorption) and biocidal glass. There are many applications thinkable that could make use of these. Think about i.e. glass-cabinets, lamps, tables, office furniture or medical furniture. However, according to large market players like Saint-Gobain and Pilkinton, their market penetration into furniture is low. In those cases where the material is used, the glass parts of the furniture are shaped and processed by the glass-manufacturer. The furniture manufacturer assembles the final furniture product. Researchers have already managed to develop "multifunctional" glass that is based on surface nanotextures that produce an array of conical features, is self-cleaning and resists fogging and glare. 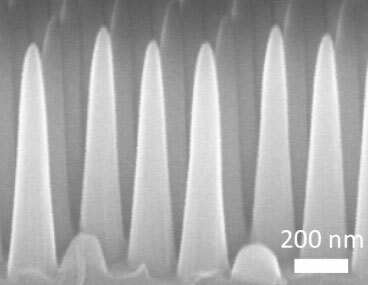 Through a process involving thin layers of material deposited on a surface and then selectively etched away, researchers produced a surface covered with tiny cones, each five times taller than their width. This pattern prevents reflections, while at the same time repelling water from the surface. Not strictly furniture, but window glass provides a huge area for using nanotechnologies to improve functionality, for instance by generating electricity from outside heat. Making use of nanotechnology for the improvement of wood occurs at various levels. First is in the production phase of the material, in forestry, where nanotechnology is being applied for the production of more sustainable wood products. Nanotechnology is for example used in the design of biocides to protect the wood against pests or fungi. When wood is used to make new products, nanotechnology enables researchers to study the wood performance in greater detail. Nano-indentation is a technique that is used in these studies, but also SEM (Scanning Electron Microscopy) or TEM (Transmission Electron Microscopy) are techniques used in these studies that benefit from equipment innovation at the nano-level. These types of studies lead to a better understanding of the wood performance, which is especially interesting for high demanding applications, for example, where strength is a critical factor. In the production of wood composites like particle board, MDF or OSB, nanotechnology may assist in increasing the durability of the composite material (see for instance "Quality of wood composite boards improved by nanoclay, silica nanoparticles"). For example, by improving the glue system. One of the issues related to the long term performance of wood and wood composites is their thickness swelling when they become exposed to water. This may happen due to cleaning activities, but also in kitchens, bathrooms or outside. Various techniques have been developed using nanotechnology that do reduce this swelling. For wood preservation, nanomaterials may reduce the need for preservation techniques like furfurilation or acetylation. For example, by using nanocoatings for water-protection. However, also the biocide system implanted in the wood during its growth phase may still be active in the application and use phase of the wood product. As the traditional preservation techniques are energy demanding and lead to undesirable emissions of chemicals to the environment, the long lasting effect of nanomaterials used as biocide may contribute to the future enhancement of more durable wood products. Nanotechnology can also be used to keep wood preservatives inside the wood. For research on nanotechnology and wood also take a look at Purdue University's NanoForestry site, the European SustainComp nanotechnology project to develop advanced wood-based composite materials, or TAPPI's Nanotechnology Division. At the level of R&D, there is a lot of activity in the field of nanocomposites. Both for ?plastic composites? and for wood composites. For wood composites, potential applications have been described that make use of nano wood fibers to optimize the strength and performance of composite materials. First contacts with the composite industry however, do suggest that this application has not reached the market yet. Adding nanofibers to optimize the strength of composite materials is relatively costly and appears not to be as effective as was assumed in earlier research. For many applications at the level of the constructive material, microscopic fibers are similarly effective with an additional cost benefit. At the level of the surface performance however, nanocomposites may have added value. Metal improvements using nanotechnology take place at the level of metal-structure modification or at the level of surface modification. A better control of the metal production process at the nanoscale of the material enables the fabrication of stronger, more durable metals. This type of modification takes place at the metal structure level. This means the organization of the metal structure at the nanoscale and doesn?t necessarily involve the addition of nanomaterials. Still this can be the case though, for example in alloys that are being improved by adding small amounts of nanomaterial, allowing for a more homogeneous distribution in the metal structure. With these metals, one can shape more light structures with a similar performance as was achieved before with more heavy alternatives. One example in which this technology is used is in the body of the Audi A6 series, where weight reduction directly pays-off in less fuel consumption. In furniture, no examples could be found to date. Surface modification of metals focuses on coloring, preservation against oxidation and corrosion and on improving scratch resistance. One way of doing this is via an electroplating process using metal salts. Nanosizing these salts leads to an optimum surface coverage, which results in a much stronger preservative layer that is better resistant to external factors like corrosion, oxidation and scratching. This technique, being slightly more expensive than the lower quality electroplating, will preferably be used for the more expensive, high quality furniture or for furniture with specific demands. Examples hereof are furniture for outdoor marine environments or boats. Nano-sizing pigments like TiO2 can be used to change color depending on the exact size of the particles. Electroplating can accordingly be used to obtain nicely colored metals in shades from yellow to blue to magenta. 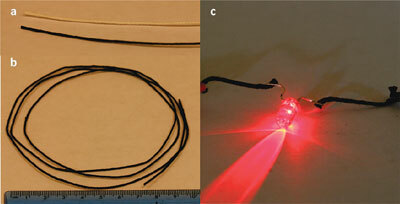 Nano-textiles can be produced by a variety of methods. The key difference among them is whether synthetic nanoparticles are integrated into the fibres or the textile, or are applied as a coating on the surface, and/or whether nanoparticles are added to the nanoscale fibres or coating. However, information about manufacturing methods, the nanomaterials themselves and the quantities used, as well as the "life cycle" of the "nano-treated" textile for sale is largely unavailable to the consumer. Our Nanowerk Spotlight "Nanotechnology textiles" clarifies nano-textile manufacturing processes and application areas, and gives an overview about the potential effects on the environment and health. Application areas for nanotechnology are easy-to-clean textiles, biocidal textiles (see for instance: "Innovative medical nanotechnology textiles eliminates bacteria"), or textiles from nano-cellulose, which enables the manufacturing of new environmentally friendly materials. More advanced nanotechnology applications would lead to electronic textiles, for instance e-textiles for biomonitoring and wearable electronics. Photographs of CNT-cotton yarn. (a) Comparison of the original and surface modified yarn. (b) 1 meter long piece as made. (c) Demonstration of LED emission with the current passing through the yarn. There is only very limited information available from open literature describing possible applications of nanomaterials for the optimization of adhesives for furniture applications. Nanomaterials that are described are based on silica or silane compounds that act as cross-linking agents within the adhesive polymer structure (i.e. to optimize the performance of the adhesive) or as a stabilizer of water based adhesives to fine tune the viscosity of the product. One nano-innovation, aimed at optimizing the interaction between materials during gluing is developed by NanoFab. A technique called electron plasma-sputtering is used to roughen the surface of the substrate that is to be glued. In principle, this substrate can be any material, for example a textile, a composite or a plastic or rubber. Roughening takes place at nano-level and can be described as an extremely fine abrasion. The result is a highly optimized interaction between the glue and the substrate surface leading to the formation of high strength adhesion and more durable furniture products. As nanomaterials are typically new and expensive and the majority of the furniture sector is a relatively conservative one, main movements in product development are observed in the application of nanocoatings. These nanocoatings typically make use of one nanomaterial to introduce a specific functionality and then change the coating base to allow for the application on a large variety of substrates.